In 1957, the Soviet Union launched Sputnik I, the first artificial satellite to orbit the Earth. Despite it being a 23-inch diameter, 184-pound metal ball that only transmitted information for three weeks, Sputnik triggered the Space Race. For the next decade and change, the U.S. and the U.S.S.R. worked to launch more satellites and eventually go for the moon – literally. 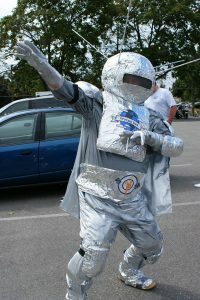 Sputnik also resulted in one other major development: the creation of Sputnik Fest in Manitowoc, Wisconsin, an annual festival that takes place this weekend. 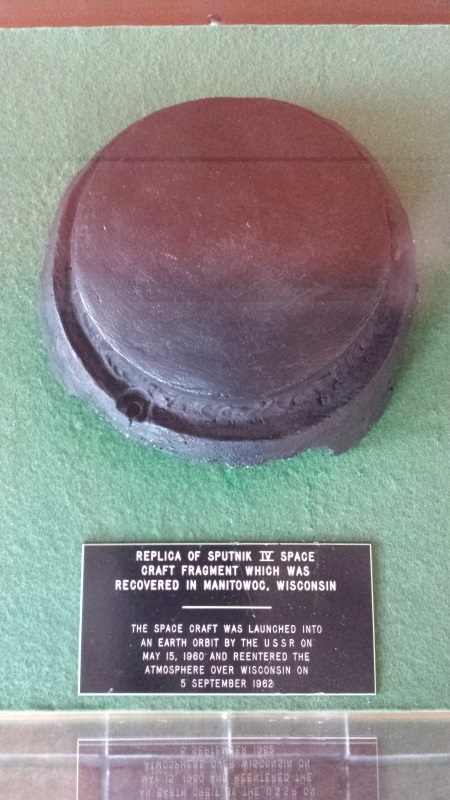 A NASA-created replica of Sputnik IV’s surviving piece that crash-landed in Manitowoc. Here’s how Manitowoc got involved. On May 15, 1960, the Soviets launched Sputnik IV, the first spacecraft designed for potential human space flight. It had everything from scientific instruments and a television system to a self-sustaining biological cabin with a human dummy, all to study a life support system and the stresses of flight. After four days in the atmosphere, the descent module was separated from its equipment module and retrorockets were fired. However, a bug in the guidance system pointed the capsule in the wrong direction; rather than dropping into the atmosphere the satellite moved into a higher orbit. After hovering above Earth for over two years, the descent module re-entered the atmosphere on September 5, 1962. A red-hot piece of Sputnik IV then proceeded to land smack dab in the middle of U.S. 10/8th Street in Manitowoc, right in front of a mansion that today serves as the Rahr-West Art Museum. It wasn’t a large piece – about 20 pounds – and no one was injured. But some were a little freaked out. This was 1962, during the era of the Cold War and the Cuban Missile Crisis. A piece of Soviet spacecraft landing the middle of their street?? 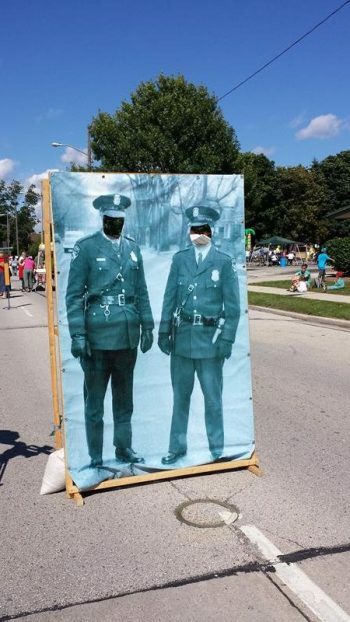 Yeah… freaky. It may have been enough to get people to stop analyzing the lyrics to that new “Louie, Louie” song for a while while they marveled. Two police officers, Marvin Bauch and Ronald Rusboldt observed the piece of Sputnik IV, initially dismissing it as trash or a piece of slag from the local foundry that may have fallen from a truck. 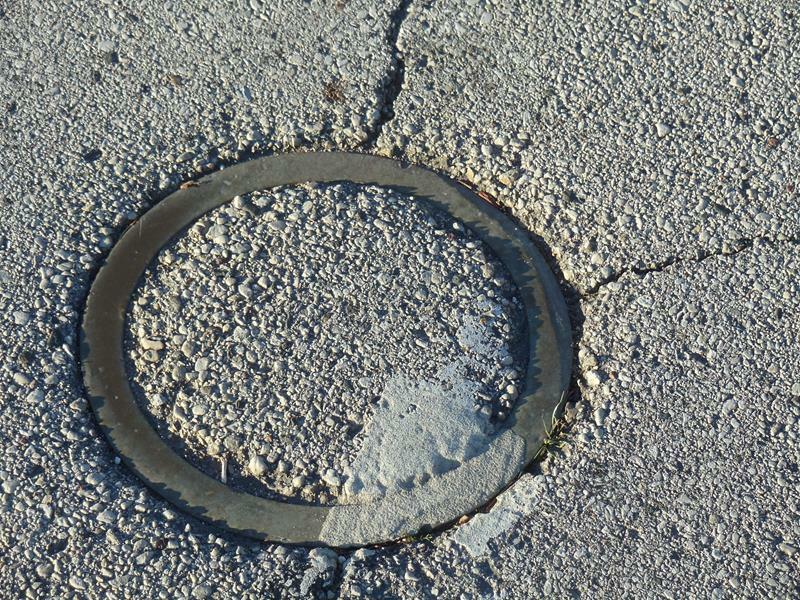 Having heard about the breakup of Sputnik IV and finding the hunk still hot to the touch – and embedded slightly into the asphalt – they made the association. Eventually it cooled down and was checked for radiation at the fire department (result: negative.) 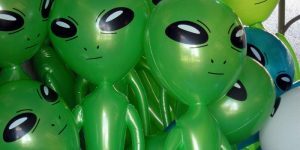 Nine days later it was offered back to the Russians – after NASA had come in and made two cast replicas. 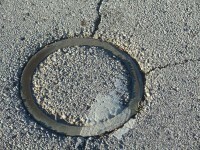 This ring marks the spot were Sputnik crashed in (yes, IN) 8th Street in Manitowoc. One remains within a few hundred feet of the crash site inside the Rahr-West Museum. You can view it there along with the artistic works of Picasso, Georgia O’Keeffe, Andy Worhol, and Milton Avery, a rare example of an art museum also showcasing space junk. 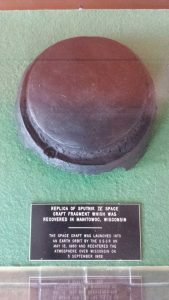 Want to see the actual spot where the piece of Sputnik IV landed? On November 15, 1962 the International Association of Machinists embedded a brass ring in the exact spot – right in the middle of 8th Street. It’s still there, although with 8th Street being a fairly busy one-way street leading north out of downtown it’s not the safest place to snap a photo. A plaque along the street and sidewalk parallel to that spot also marks the location, by the way. So how does a city commemorate such an unusual event? With one of the “funkiest festivals in the country” according to Reader’s Digest. The second weekend of every September, Manitowoc celebrates “Sputnik Fest” to commemorate the glowing visitor’s anniversary. Sputnik Fest draws plenty of space fans – with Star Wars and Star Trek characters well-represented – enjoying costume contests, music, go-kart racing down 8th Street (there’s a bit of a hill towards the heart of downtown), food, drinks, and even an “alien drop”, where hundreds of mini-alien figures are dropped from a cherry picker – some with prizes. Even the hosting group, the Rahr-West Art Museum, calls it a “wacky tacky” weekend. Music from bands like the Happy Schnapps Combo, playing the night before as well, add to the fun! 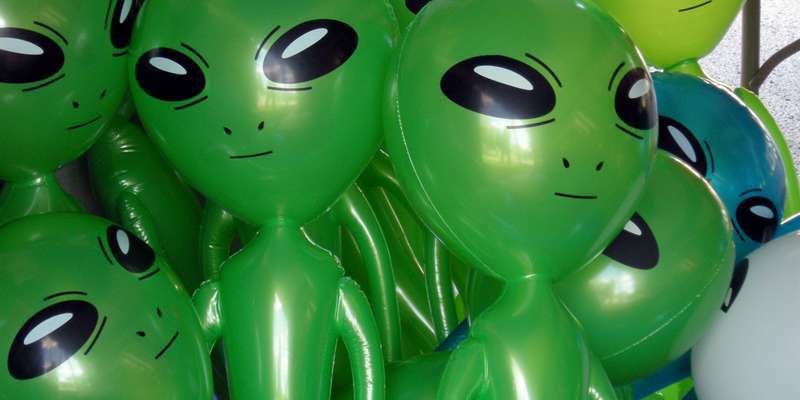 Sputnik Fest begins with “Aliens in the Alley” on Friday night September 8th, with music from the Happy Schnapps Combo, food, refreshments, and the crowning of – yes – MS. SPACE DEBRIS! We love that. The rest of the events take place Saturday, September 9th, starting at noon. Basically at Sputnik Fest, science fiction rules the day – even though Sputnik itself was very real. 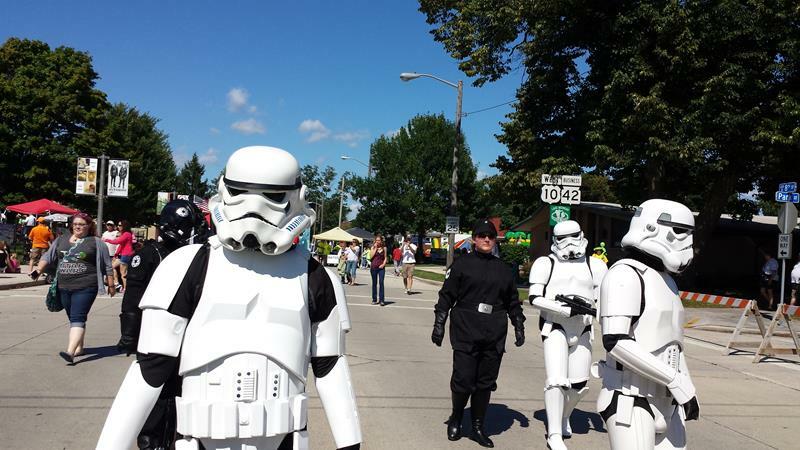 Get more information on Sputnik Fest here and check out one of Manitowoc’s most out-of-this-world festivals. The city is minutes off I-43 via U.S. 10, U.S. 151, or Highway 42. Hey, it’s September, why not shoot for the stars? 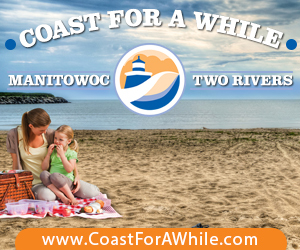 See more on StateTrunkTour.com, or check out more details on Sputnik Fest and everything else to see in town on the site of the Manitowoc Convention & Visitors Bureau.